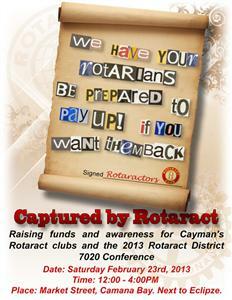 Rotaract District 7020 invites you to get Captured by Rotaract! Come out to Camana Bay on February 23rd and meet your Rotaractors. Find out what Cayman's Rotaract clubs are doing on island and around the world to inspire peace and nourish tomorrow. In addition to promoting our local Rotaract clubs we're putting Rotarians to work to raise funds and awareness in aid of the 2013 Rotaract District 7020 Conference. WHERE: Camana Bay- Market Street, Next to Eclipze. Rotaract Blue would like all past, present and future sponsors and supporters to come out and see what we've been up to.